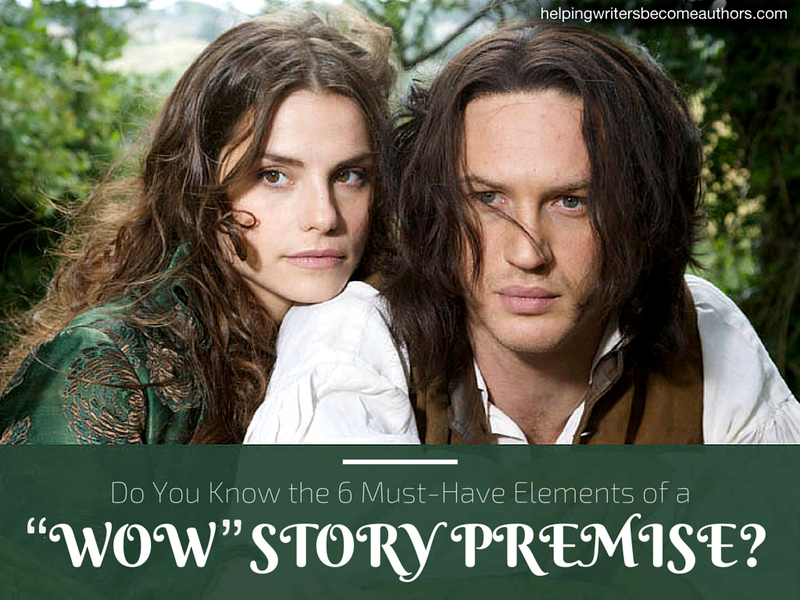 Do You Know the 6 Must-Have Elements of a “Wow” Story Premise? Story premise is the foundation of all good books. It’s the fundamental kernel of the beginning idea. But it’s more than that. If you can craft a solid story premise right from the beginning of your writing process, you will be able to capture all the concrete details necessary to bring your story to life. As most of you probably know, I’m a tremendous advocate of outlines. As such, the premise is always my starting point for creating a full-fledged outline of every story I write. But even if you’re the freewheeling sort who prefers not to create detailed outlines before writing the first draft, a solid story premise can offer you a mini-outline capable of guiding and informing everything you write. This is why you should always go that extra mile with your premise. 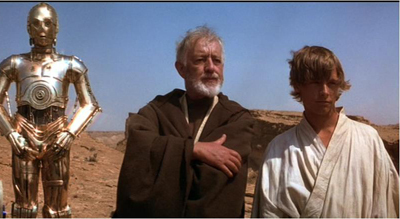 If you settle for vague cliches in your story premise, you’ll inevitably end up with a vague and cliched story. Before you ever sit down to write your opening line, take a moment to identify the six elements required by any premise–and take another moment to figure out how to make those elements so entirely awesome they take your breath away. Featured in the Outlining Your Novel Workbook. 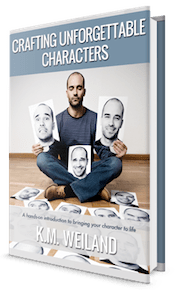 Every story starts with character–and not just any character, but the character. Whose emotional and physical journey will you be following? Who has the most at stake? Whom do you find the most interesting? Or–if the plot idea came first–who will be most suited to taking full advantage of its possibilities? Situation is the first kernel of your plot. This is the status quo in which your protagonist finds himself in the beginning of the story. What is the hero’s personal condition at the beginning? 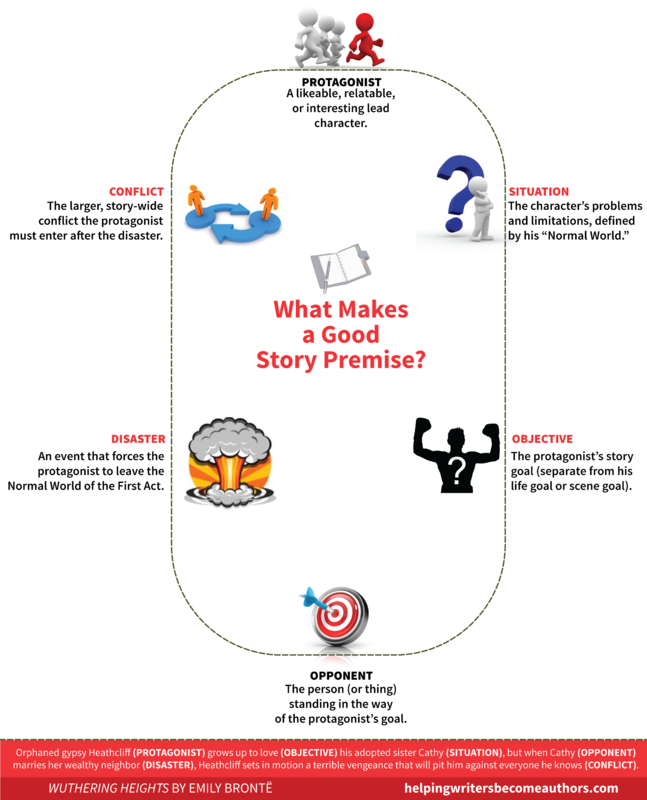 A protagonist has no business showing on the page without an objective. If he doesn’t want something and want it badly enough to do just about anything to achieve it over the next couple hundred pages, then he doesn’t deserve to have a story told about him. At the beginning of the story, what does the hero want? Even an awesome character with a passionate goal isn’t enough to drive a story. For that, you need conflict, and before you can even consider conflict, you have to create an antagonistic force that can stand in the way of your protagonist’s objective. Who is your story’s opponent? How is this person or entity standing in the way of the hero achieving his objective? What is the opponent’s goal? What is his relationship with the protagonist? The first quarter of your story will allow you to set up your characters and their world. 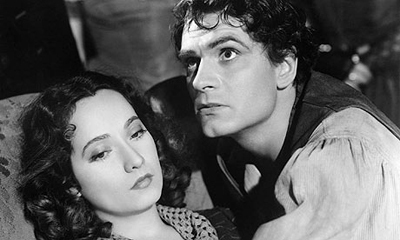 But something dramatic has to happen at the First Plot Point to force them into action. Usually, this moment will be a comparatively disastrous one that destroys your protagonist’s Normal World or estranges him from it. What will be the disaster? How will it be the result of the protagonist’s attempts to achieve his objective up to this point? How will the protagonist respond? How will the antagonistic force respond? All of a sudden, you almost have yourself a story. All that remains is to see where your characters’ reactions to the disaster in the First Plot Point lead them. What’s the story’s main conflict? How is it a result of the hero’s reaction to the disaster? How will it pit the protagonist and the antagonistic force at cross purposes? What is the logical flow of cause and effect that will allow this conflict to continue throughout the story? And just like that you have a solid story premise on which to build your entire book! If you find yourself struggling to construct the actual sentences, take a second look at your original answers. Could any of them be strengthened to be more specific or original? A good story premise is worth spending some time on. 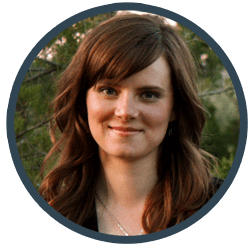 In the end, you will have emerged possibly having identified and eliminated structural weaknesses and definitely having created a valuable tool for outlining and pitching your novel. Great post. I love your lay out of it. I have seen this put together many ways before, but I really like yours. I also really like the aesthetics of your post. I added your link to my list of good articles about writing. Thanks so much! I appreciate the shout out. I’ve been reading a lot on this subject lately. Your post was the most straightforward I’ve read so far. Mind I like short and to the point posts. Thanks for the information, as usual. Oh, great! Definitely a premise if worth even revising it to be sure it si on the right path! Definitely! It’s always worth the extra effort to refine a premise upfront – rather than discovering down the line it doesn’t have enough worth to deserve an entire story. Thank you so much for all your posts. My comment is in reference to story premise #3. Does the characters objective have to remain the same throughout the story? My character ‘thinks’ her life needs to be lived a certain way. But, by the end she gets what she needs and it’s almost the opposite of what she originally thought she needed. Thanks a bunch, the link was very helpful. I figured I was doing okay, just wanted to be sure. How fun! Nothing beats a new story idea. This is phenomenal. The graphic alone is worth the time to read the article but your idea of breaking the six story elements down into a series of questions is genius. Anyone who takes this and fills in the blanks is going to have a solid outline for a great story at the end. Thanks for the freebie! I’m printing it and using it for every novel going forward with all credit to you, of course. You bet! Glad you enjoyed the infographic! Patterns, “and” formulas… totally, we can identify the reality that we’re part of via these. And thus, that’s how we transcend, whether as artists, trying to create a great work of art, or (my own ambition) as a just very species of being, trying to leave this dimension of reality behind for another: finally becoming, and then sustaining awareness of these such two.. The Representative both fulfils, “and” falls short.. It establishes character, it establishes their situation, it establishes their enemy, their objective and so on: it only however fails to progress beyond all this, its very identity as a whole being to just announce it all. Ultimately, I think this is what we’re all striving for: to both adhere to and transcend the patterns of good art. Oh, but, ah, I’ve read lots of successful stories that don’t begin with the main character, they begin with a situation – how would we classify it? One of my stories begins with a situation, a battle – the main ‘character’ doesn’t appear until Ch3. I’ve introduced the ‘antagonist’ and the situation first because it is both the catalyst for bringing the protagonist into the story and for behaving badly later. It’s true we see this technique quite often. Not that this is a hard and fast rule, but I always recommend authors to figure out a way to start with their main character. 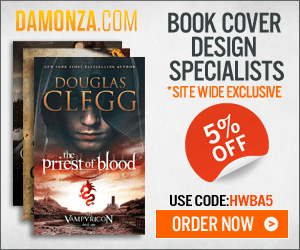 It can make all the difference in hooking readers right from the start. Starting with the protagonist in my stories would make them start slowly; the protagonist is simply living their life as they normally do until something happens. My first two novels begin this way, with the protagonist going about their daily life and then getting dragged into something they couldn’t imagine was going to happen when they started out for the office that morning. Like in the example above, the protagonist reacts to what the antagonist does, not the other way round. If I do what you suggest, I’d have to rewrite my stories and that would be odd, I think. That’s just my feeling about. The protagonist doesn’t immediately get into a scrap, the antagonist does. The antagonist starts a fight, the protagonist tries to deal with it. Sometimes the protagonist has to pull a rabbit out of a hat to deal with it. I don’t see this as magic so much as someone engaged in lateral thinking in a difficult or challenging situation. Bascially, what you’re saying is this wouldn’t work for you. Is that right? Element #1: there is no main ‘hero’; many heroes emerge throughtout the story as it progresses. They each have a role to play and either succeed or fail. Many emotional journeys are followed, not one single journey – however, one journey emerges as ‘the’ emotional journey. The stakes are high for all; but one group emerges with more to lose than the others. ‘Whom do you find the most interesting?’ I’m rooting for the team with the most to lose. The plot was inspired by a previous story – this story is like the backstory about how one particular group became to be in this situation though not covered in the first. Who will take full advantage of the plots possibilities? That’s the twist in the plot – that is revealled late in the story. Element #2: the story starts with war between two groups indirectly linked with the protagonist – I mean, both of these battling groups are linked with the protagonist, one more than the other; the ‘heroes’ condition at this point is the status quo; the ‘heroes’ condition is changed when the antagonist comes knocking on their door, of course. Element #3: initially, all ‘heroes’ are pursuing personal goals (working hard to achieve them), until the antagonist comes knocking and these goals are put on hold – knew goals emerge from the interaction; the choices the ‘heroes’ make in order to get back to what they were initially pursuing will astound them making them question whether those goals were worth pursuing in the first place, until they are fading memories. Element #4: the anatagonist wants what the ‘heroes’ and the others have; the antagonist tries to take what the ‘heroes’ have by force, forcing the ‘heroes’ into action; the antagonist has been around for ages, in the ‘heroes’ peripheral vision like an annoying mosquito, and that’s all the antagonist has been, until the antagonist surprises them by doing something they least expect. Element #5: the disaster is the antagonist surprising the hell outta the unprepared ‘heroes’; it is the antagonist’s desire to have what the ‘heroes’ have and has always wanted but was denied – the antagonist has evolved; the ‘protagonist’ is unprepared for the antagonist and antagonist’s behavior presents the protagonist with a moral dilemma; the antagonist responds as the protagonist responds until the antagonist is outplayed, like a game of chess. Element #6: the stories main ‘conflict’ is the ‘protagonist’ facing a moral dilemma; the ‘protagonist’ is torn between two choices neither or which is appealling; the antagonist is not so much at cross-purposes with the ‘protagonist’, except initially in wanting what the ‘protagonist’ has, and the protagonist not at all willing to give it up; but the protagonist is placed at a crossroads not of their choosing; the situation has placed them at the crossraods; then the plot twist occurs – the protagonist thinks the ‘heroes’ have saved the day, and their collective asses (everyone affected by the antagonist), only to learn there was a second wave of conflict following the first albeit hidden behind the first wave of conflict but exposed by it leaving them with nowhere to run. This is definitely *not* a hard and fast rule. And I always recommend authors to follow their own feelings about their stories. But, yes, in the vast majority of instances, I find slower character beginnings ultimately much more interesting than faster beginnings that introduce other characters, especially antagonists. Straight to the pin-up board! Great advice very well put together. Thanks. Nice, specific instructions. I was struggling with defining my premise, so this couldn’t have come at a better time! Premises can be a lot of fun to construct. Enjoy yourself! I really loved this post and can clearly see how having all of these questions from the start would help in trying to build a strong outline before writing a novel. That being said, narrowing down exactly how to portray the premise of my current work in progress in a succinct way that gets the situations and the core of the story across is something I’ve been struggling with for years. The novel consists of dual timelines to tie it (and the series it begins) together. The timelines are more or less on equal standing with all the structure and elements spoken of in this post for both. The present day timeline gives emphasis to the start of the overall series plot , while the past timeline emphasizes the current novel’s story question as a whole and how both timelines feed together. Can you offer some advice on how to represent both of these in a concise way when offering my “premise” to agents, editors, so on so forth, as well as for myself to strengthen the novel’s core as I dive into my revisions over the next couple months? Ah yes, the difficulties of dual timelines. What I generally like to do is first write a premise for each timeline, separately. Which best encompasses the heart of the story? That’s probably your best bet for pitching and marketing purposes. But there’s nothing wrong with using both premises to guide you as write. Glad to be of help – especially to a regular commenter like you! This is helpful at the right time… Thanks! Great Post. It was really helpful ant clear to the point. Yet I have a few questions. Is the premise sentence equal to the pitch? Or where is the difference? What if I have two protagonists in my story? Do I write a premise sentence for each one? And in reference to story premise #4: Can a character be protagonist and antagonist at the same time? Yes, the premise sentence can definitely be used as a pitch. You don’t *have* to write a premise sentence for each character, but it can definitely be a good exercise for figuring out the heart of each character’s story, and, indeed, which character *is* the heart of the story. A character will always be the protagonist of his own story. But it’s very possible the protagonist in one plotline could be acting as an antagonist (an obstacle) to another character. Premise is what you write on the zoning form, explaining your intentions. It’s the smallest of summaries – your story whittled down to its core intention. I’ve worked through the post once, so far, will do so a couple more times with that information in mind until I come up with something resembling your examples. Thank you. In my previous life I was a not-very-good fiction writer. Now I’m a very good nonfiction writer, and I enjoy that, but I’m dipping my toe back into writing fiction. I know what I was not good at and what I was good at. And I’m doing it for fun, so I have room to learn and grow without pressure. I have your books and workbooks and have found them really useful. I love this pointer about premise, and I see where I can go back and do more effective work in that area. We’re all (hopefully) moving toward improvement. Knowing our strengths and weaknesses is a huge step in the right direction, since it actually gives us a road map of sorts to guide our education. Very straightforward. Sometimes when coming up with supporting characters and subplots, my protagonist is sometimes overshadowed and main objective is overlooked. This chart will help me keep the characters on track. I’m making it my desktop wallpaper right now so I’ll see it every day when I sit down to write. Yes, it’s extremely easy (and tempting sometimes) to get derailed by fun minor characters. It’s always worthwhile to keep reminding ourselves of the true focus of the story. Most comprehensive and helpful post I have read till this date. Premise happened to be something I always had difficulty understanding, much less tackling. But through this post, I have gotten all the necessary tools to construct one myself. Awesome! That’s great to hear. Best of luck writing yours! I loved this post in every way! Thank you so much for sharing. I shall keep this imagery posted in my mind. Spot on!! !